Put simply, Prime Design makes the absolute best Aluminum Side Access Rotation Rack on the market today. It eliminates reaching and stretching when loading and unloading ladders. This ergonomic rack includes Prime Design's innovative rotation mechanism which features an hydraulic assisted design that lets you load and unload your ladder safely, quickly and easily without ever reaching over your head to do so. Put simply, Prime Design makes the absolute best Aluminum Side Access Rotation Rack on the market today. It eliminates reaching and stretching when loading and unloading ladders. This ergonomic rack includes Prime Design's innovative rotation mechanism which features an hydraulic assisted design that lets you load and unload your ladder safely, quickly and easily without ever reaching over your head to do so. A telescoping handle gives you the leverage to swing ladder into position with just a simple twist and the exclusive hydraulic system lowers your ladder gently to the side of your van—all in a matter of seconds! Racks have a 300 pound capacity, come complete with stainless steel hardware and are protected by a durable white powder coat finish. Racks mount in a full length aluminum channel that attaches to the vehicle utilizing existing factory mounting points eliminating the need to drill holes in the roof. 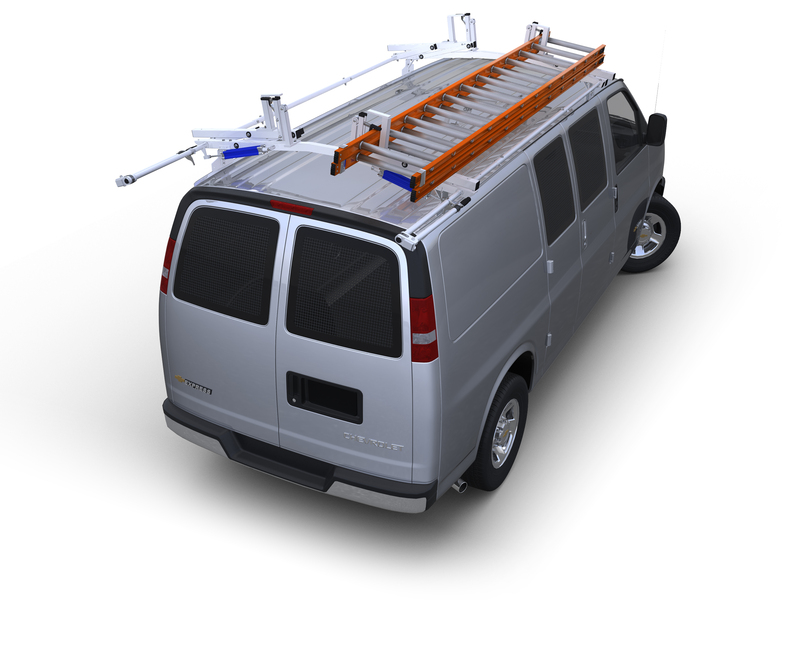 Racks are available for your RAM ProMaster City with hydraulic assisted rotation on just the curb side of the vehicle or both the curb and street sides. If purchased with the curb side only the street side rotation upgrade (available below) can be added at a later date. Ladders up to 24' can be easily carried on these racks.